We’re in the midst of planning a kitchen remodel, which will include a tile backsplash. The stone stairs out the kitchen to the back patio, which we had rebuilt a couple years ago have shards of our pottery embedded in them. Now that we have a studio at home, it seems like we should include some tiles in our kitchen too! I’ve purchased a couple tile cutters with the idea that I’d make some tiles for the kitchen, but hadn’t used them until recently. The designs are getting more solidified, so tonight I finally broke out the slab roller and tile cutters. We’ve put a lot of work into our garden lately, and the presence of so many beautiful plants is one of the reasons we bought this house (nearly 15 years ago!) So, it only seems right to tie the kitchen in with the garden. 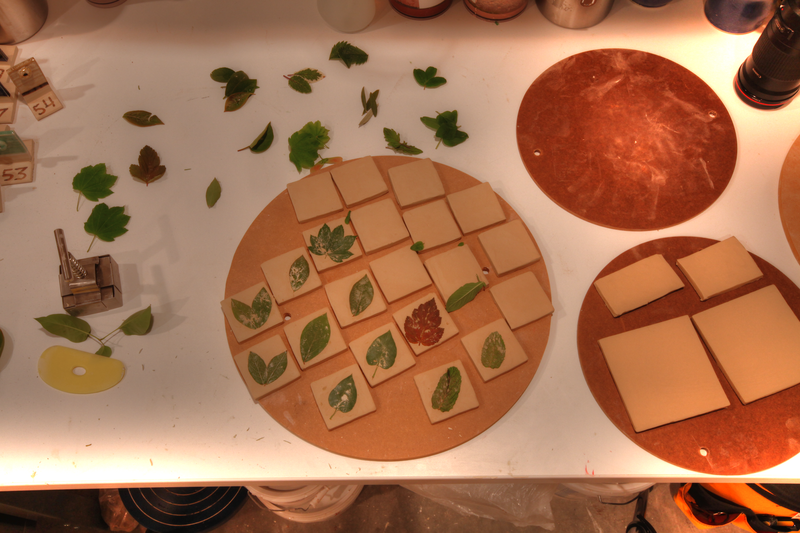 After letting the cut tiles dry and firm up a bit (read: Super Mario Galaxy 2 with the family), I went on a foraging trip around the yard and pressed the results into the tiles. Represented here are, blueberry, maple, lilac, mint, tomato, strawberry, lemon, two kinds of sage, roses, oregano, and believe it or not, leaves from an olive tree that actually bears in Seattle. We’ll likely not use many of these, but one of my rules in pottery is to make way more than I need so I can toss out those pieces I don’t love. 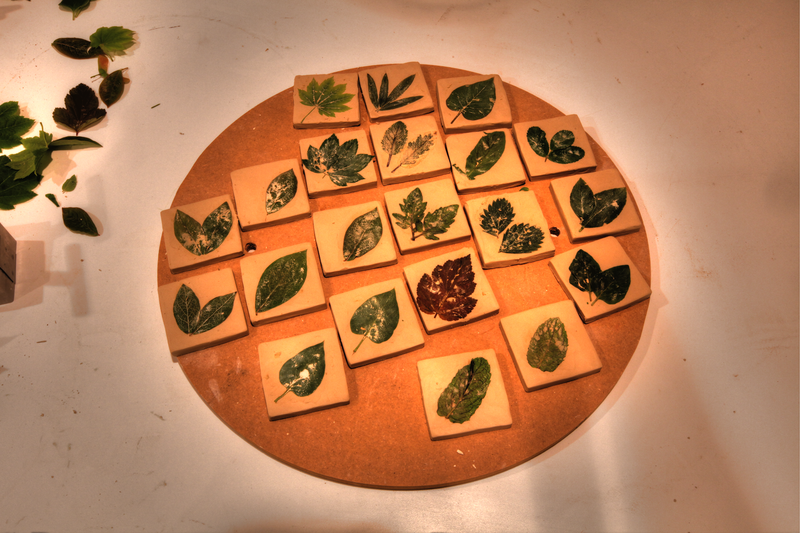 Once these are fired to bisque, I’ll glaze them clear or white, stain the leaves with chrome oxide for green and in at least a few of the off-center blueberries placements, I’ll add some some spots of cobalt carbonate for blue. I realized only after pressing all these leaves that I forgot the King of our yard, the pear tree. Clearly another round is in order!